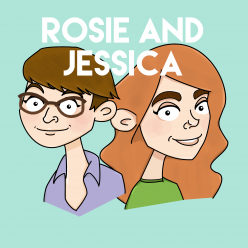 In episode 55, Rosie and Jessica bring you some Marvel-lous reviews of both Netflix’s Daredevil and Avengers: Age of Ultron. They’ve also taken in some tearooms within the M25 and appreciate the smell of bacon in the early hours of the morning (yes, even The Vegan.) All that, plus songs, Needle and Fed and outrageous amateur dramatic costuming. Jessica picked B.C. Orienteering by Said the Whale and Rosie picked Sparks’ Lighten Up Morrissey. You can visit this Tina Fey portrait at the Watts Gallery. We visited the Urban Tea Rooms and Cutter & Squidge. Rosie has nearly finished her Humphrey. Maybe Rosie joining One Direction couldn’t make it any worse? Bookish Blether, for your book podcast needs.